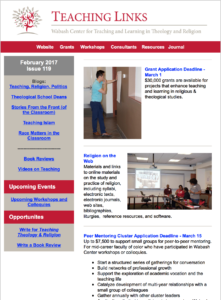 Teaching Links, the Wabash Center e-Newsletter, is a monthly email alert. The email contains links to new and highlighted teaching resources available on the Wabash Center web page as well as links to resources of interest available through other reliable sources we recommend. Teaching Links will link to short, helpful, reflective pieces on teaching, announcements of new Wabash programs and other opportunities to network with teachers of religion and theology.